Stuck pixel? – fix with JScreenFix or these other tools! Even if you know about jscreenfix, this article will show you how to use jscreenfix in easy steps, plus give you some alternate options like flexcode and the pen tip pixel method. All of these are free! This guide will show you how to fix stuck pixels with software tools and other methods. They usually show up as small red, blue, or green dots on your LCD monitor and can be very annoying. The good news is that they can be fixed. In this article, I will give you instructions on how to get rid of them yourself without having to send your monitor off to a repair shop. How to fix a stuck pixel! Save your annoying monitor problem – don’t live with the problem, it really can be fixed, and in some cases quite easily. So whatever you do, don’t throw away your monitor just because it has some stuck pixels. In the old days with CRT monitors you may have seen techs fix them using an electronic magnetizing device. Since monitors are quite different these days and fixing a stuck or dead pixel with software is the safest solution, I recommend trying this first. Then I’ll show you another option if this doesn’t work. Since fixing a stuck or dead pixel with software is possible for LCD and plasma monitors, lets check you have that and apply it. It will appear as though you have stuck pixels or dots on-screen, regardless of the changing picture around that (or them if you have more than one on there). Most of you have probably seen it where you get a little dot visible different to the rest of the monitor screen, but it does seem to change in some way as the colors around it change. If you wipe your monitor with a clean dry cloth you will likely find that it is just a small drop of water or dust which refracts the light from surrounding pixels. I know it’s an obvious one but it doesn’t hurt to remind you to give it a wipe first just in case. Click “Launch JScreenFix” at the bottom of the page. Note some people use a youtube video which flashes the whole screen. Do not use this or be wary not to look at the monitor if you or your client is prone to seizures. Step 3: Surgical precision time! Well not really surgical precision, that’s just my lame attempt at humor. There is plenty of room for error even with the worst hand-eye coordination! Move the JScreenFix window over the dead pixel and let it run. If JScreenFix does not fix your stuck or dead pixel, then not all hope is lost. There is another method for fixing them that doesn’t involve software. With this method, there is the potential to cause more damage so you must be very careful. You can try flexcode LCD. The instructions are pretty self-explanatory as you can see in the screen copy below. If that doesn’t work, you can try flexcode LCD2. They say it is a faster and lighter program, and it does have a very simple user interface, working on Android 2.2 with Flash 10.1 (tested with google TV also) but for my particular system it was very slow to load. WARNING – there is risk of damage so be careful or if you are more worried about further damage then don’t do this. Read in full before following the steps. Especially don’t do this with someone else’s monitor unless you have briefed them on the potential for damage. This is a very fine tip to use with the pen tip pixel method. You could actually use the other end if this is too sharp a point. You might want to try a pen or pencil with a larger diameter tip (see text below), depending on the monitor resolution of your device. Fix a stuck pixel with this alternative method! Turn off your computer monitor. Some like to unplug it but for what we are doing it is not necessary. Step 2: Prepare your blunt object! This is how you prepare your tool for the careful job of applying subtle pressure. Take a wash cloth and wrap it around a pencil or pen with a dull point. Read this in conjunction with the next step before you start. Apply pressure to the area with the stuck or dead pixel. Don’t press to hard or you could damage your screen further. While applying pressure, turn the monitor back on. Remove the pressure and remove the tool. Check visually to see if the pixel has been fixed. I suggest you try very gently at first, with a pressure you’d be comfortable touching the screen with anyway. If it doesn’t work the first time through and your monitor pixel is stuck still, then just repeat the process with a subtle increase of pressure. It really can work so be brave once you are committed. You can try to mentally block it out, but I know sometimes once someone starts obsessing about something they just focus on it more and more, until it becomes an obsession. The following is not my preferred option, but I suppose I may as well point out that if the stuck pixel is in a position too noticeable, and you obsess about it then you can try this hack. Using a very fine point pen, mark over the pixel with a black dot. Instead of a black dot you can try a grey color, as this might give a more moderate result. This will cut light from the dot, making it stand out less. It works because the stuck pixel is often at full light intensity. Reducing the intensity reduces the visibility of the stuck pixel. I’m not sure it is much better, but it comes down to personal preference. I’d only bother to try this is the above options aren’t effective and you decide to live with it the best way possible. Also I would be worried about the solvent type in the pen you use. Important point: You should try using a removable marker or whiteboard pen! That way if you don’t like the effect you can just wipe it off. If you don’t have one and have the skill, you can try to cut a fine piece of clear tape and put a permanent marker on that, before you stick it on there. I have never tried it, it is just an idea but I expect the tape could refract more light and make it look worse. Go to your local monitor expert and see if they have a professional option that won’t break your bank, or at least cost more than the stuck pixel problem is worth. None of these methods are guaranteed to work. 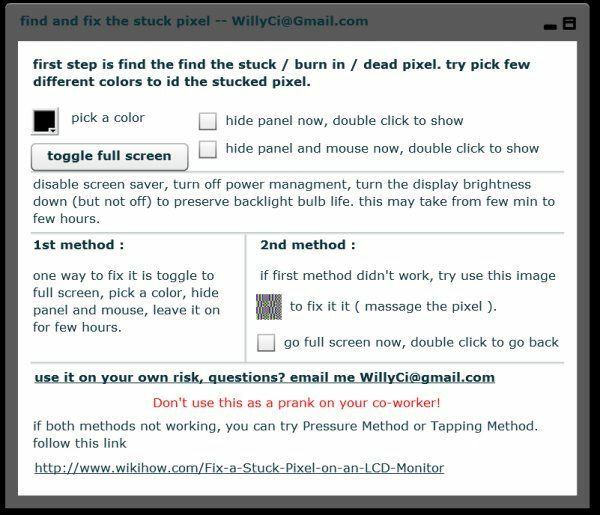 If you know of another successful method for fixing stuck or dead pixels, please feel free to share. You can try JScreenfix if you follow the above steps and then if that doesn’t work try flexcode LCD and then one of the other non-software options like the pen tip pixel method provided above. Your guide for recovering data from hard disc is very helpful. I was using Sagate Freeagent 1Terabyte hdd for storing important files and data. Since past two days, the hdd is not recognized by the system OS windows 7 professional. The external light on the hdd is blinking. Could this mean the hdd has failed? How to sove this problem? This article is about methods to fix a stuck pixel, Bhasker. 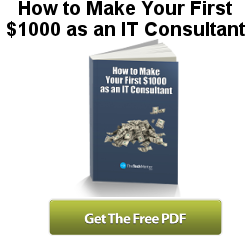 Thanks for your somewhat off-topic comment – I guess you may have been on several pages of thetechmentor.com and put this one in the wrong spot?